Note 1: The MultitrackStudio Instruments do not have any reverb, so a Reverb effect should be used to add reverb. Note 2: You can play back a MIDI track containing multiple streams ("instruments"). However, it is recommended to click the track's file name box and choose "Split Streams". This gives you more control over instrument sounds, levels and reverb send levels. The Instrument box lets you pick an instrument. The instruments appear in five categories: Keyboard, String, Wind, Percussion and Synth. You can type (part of) an instrument name in the Search box to find an instrument quickly. The Controls section contains knobs, drawbars or buttons which control the sound of the selected instrument. Not all instruments offer controls. The Effects section contains three effect slots. 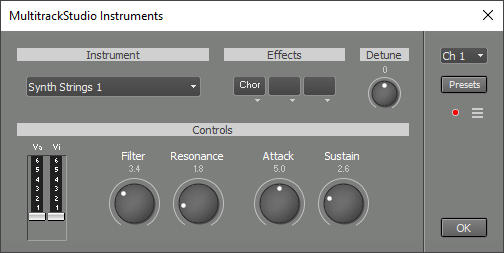 Some instruments use one or more effects by default. Acoustic and electric piano's feature a Strength knob which controls how hard the piano is played. It adds a value to a note's velocity. '2.5' is neutral position. The electric piano's Dynamics knob controls the velocity curve, ie. it controls how sensitive the piano is to key pressure. Bass and Treble are tone controls, as found on amplifiers or even some electric pianos. The Percussive Organ is percussive even if another note is playing. This is different from the Wheel Organ which follows the traditional style. Bass guitars feature a Strength knob which controls how hard the bass is played. It adds a value to a note's velocity. '5' is neutral position. Violin Section, Violin Section 2, Viola Section, Cello Section and Contrabass Section are specialized versions of String Ensemble 1. There are two violin sections in order to lessen phasing problem with unison notes. Bowed strings feature a Vibrato knob similar to the winds (see below). Most wind instruments feature a Vibrato knob. Vibrato is applied automatically depending on the musical context (especially note duration). The knob controls the amount of vibrato. You can avoid vibrato on certain notes by programming MIDI controller #1. The value at approx. 300 ms after the note onset is the value that counts. It's not possible to add vibrato where the automatic system thinks it's not appropriate. The Drum Kit uses MIDI channel 10 in order to be compatible with General MIDI. A suitable channel is picked automatically when you load an instrument, so you typically don't need to pay attention to the Channel box. Almost all synth sounds use the same synthesizer which comes in three versions: square, sawtooth and triangle. The bottom-right corner of the Controls box shows the version. The sawtooth version is used for most sounds. The four drawbars control the level of four oscillators. 8' is the root note. 8'D is a slightly detuned version. 5'1/3 is a fifth and 4' is one octave up. The Attack, Decay, Sustain and Release knobs represent a classic ADSR envelope. If Sustain is higher than "5" the level will rise during the decay phase. The pad sounds use this swelling effect. The MultitrackStudio Instruments respond to Volume (#7), Pan (#10), Expression (#11) and Sustain (#64) controllers. Pitch Bend is also supported. Acoustic pianos respond to Soft pedal (#67), and they support 'half pedal' sustain (values 64..95 are 'half'). Bowed strings and many winds respond to Legato (#68). Brightness and Treble knobs respond to #74. Vibrato knobs respond to #1. Attack, Decay, Sustain and Release knobs respond to #73, #75, #79 and #72 respectively. Drawbars and drum level knobs respond to #12, #13, #14 etc. The "Sound Effects" programs, like Helicopter or Gun Shot, are not available. A couple of percussion instruments are not available: vibraslap, guiro and cuica. The MultitrackStudio Instruments contain a couple of instruments which are not part of GM. The MIDI file will contain a program number which matches the sound closely. For example: if you pick "Violin Section" the MIDI file will contain the "String Ensemble 1" program, so the file plays back correctly using any GM player. The MultitrackStudio Instruments are typically limited to the 'real' instrument's note range. Violins, for example, won't play notes below the open G string. The MultitrackStudio Instruments are modeled, they don't contain any samples. This allows for randomizing many parameters, so each note has a unique sound which helps reducing "machine gun" effects.